Bridge column, March 5: Who is holding the high diamonds? Benjamin Franklin said, "There are three things extremely hard: steel, a diamond and to know one's self." In this deal, there are two hard things: West must work out who has the diamond ace, and East must realize who has the diamond king. North opened two diamonds with a suit that would not satisfy the purists but has become "normal" these days. South jumped to three no-trump, the contract he hoped he could make. West led the heart five: two, jack, king. What happened next? 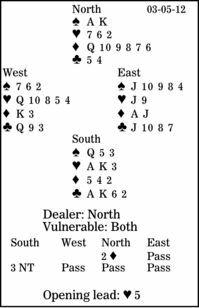 Declarer has seven top tricks: three spades, two hearts and two clubs. Needing to work on dummy's long suit, he immediately plays a low diamond from his hand. This puts pressure on West. Nervous that South has the diamond ace, many Wests would win with the king and no longer be able to defeat the contract. West could establish his heart suit, but would have no hand entry left. If South had the diamond ace, he surely would have cashed it at trick two; for one thing, the king might be dropping singleton. So West should play his low diamond. Now when declarer calls for dummy's six, it is East's turn to find the winning play. If South has the diamond king, he would not have played the suit this way. Probably he would have crossed to dummy with a spade and led a diamond toward his hand. And if West has the diamond king, East must take the trick with his ace, not with his jack, and lead his remaining heart. Now the contract must fail. Any pair getting that right deserves an award. Wed, Mar 7, 2012 : 11:51 a.m.
Declarer can give himself extra chance by ducking first heart. Defenders may assume that declarer is ducking with KQx of heart. It would then take a club shift at trick 2 to defeat the contract. If hearts are continued declarer is through.